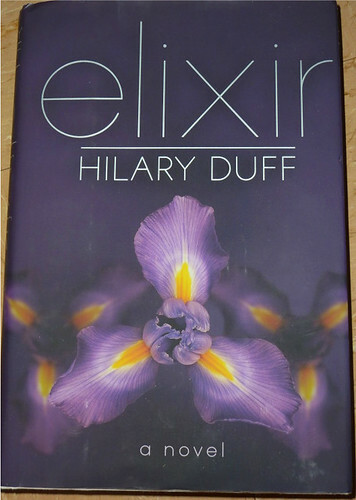 Elixir is the first novel written by pop singer and TV/movie star Hilary Duff. I’m sad to say that I feel as if the book was poorly written and was not worth the price I paid for it. I was initially drawn to the book because of the dramatic cover and that the fact that it was written by Hilary Duff. I wanted to know if Ms Duff could write a novel, since in Hollywood adding the word author to your resume is now the hot thing to do. I’m sad to say that this story did not deliver. The novel at times seems slow moving with too much excessive description of the scenery and other details which did not help the twisting plot line often times jumping between the 2 main characters. The ending of the novel left me hanging and thinking that perhaps Ms Duff had intentionally left it open, so that she would have the possibility open to writing a continuation novel for the book. What her thoughts were I can’t be sure. Elixir is the story of seventeen year old Clea Raymond, a girl from a society background who has been haunted by her father’s disappearance for several years. After a crazy event in Paris Clea begins to notice that many photographs of her also show shadow images of a man, Sage. Clea’s work as a photojournalist and a series of other events bring her and Sage face to face in Rio and Clea finds that his past has been intertwined with her through many lifetimes. In the quest to free himself of the impossible fate that would become them, Sage and Clea travel to meet the Dark Lady, Magda, and find out how to deal with the the fate that has be fallen them.